If your iPhone 8 or X frozen or not responding you may need to hard reset it. This is a button combination that forces your iPhone to restart. You can use that when an app freezes or the iPhone won’t respond to your taps. This will not erase your iPhone and all datas stay on your device. Apple made a new home button with the iPhone 7 and keeps it on the iPhone 8 too. If you had iPhone 6S or older iPhones, you can’t use the same button combination to hard reset the iPhone 7, 8 and X. The home button isn’t a physical button on iPhone 8 so it may not be responsive either. iPhone X has not home button. You need to learn a new shortcut to hard reset the iPhone. 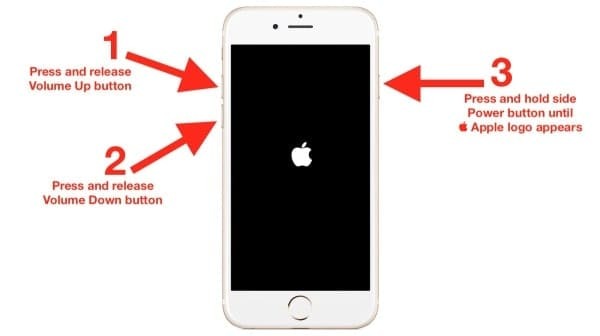 After this time the phone will reboot and you will see the Apple logo on screen. The iPhone 8 or iPhone X should then reboot in a minute and shows you the home screen and you can use your iPhone again. This does not remove the apps and it will not delete photos, videos, notes or anything like that. If the iPhone freezes very often, and while you are using the same app, you need re-install that app or check for updates. You shouldn’t need to hard reset the iPhone very often. If that happens, you should use your Apple warranty.